Defendant also ordered to forfeit $6,427,000 and all his rights, title, and interest in the painting Carnaval à Nice, 1937, by Raoul Dufy, to the United States. New York, NY - April 30, 2014 - Preet Bharara, the United States Attorney for the Southern District of New York, announced that HILLEL NAHMAD, a/k/a “Helly,” was sentenced today in Manhattan federal court to one year and one day in connection with his leadership role in the operation of a high-stakes illegal sports gambling business. NAHMAD was also ordered to forfeit $6,427,000 and all his right, title, and interest in the painting Carnaval à Nice, 1937, by Raoul Dufy, to the United States. He was sentenced by U.S. District Judge Jesse M. Furman. NAHMAD operates the Helly Nahmad Gallery out of the Carlyle Hotel in New York, New York. NAHMAD and defendant Illya Trincher operated and led a nationwide illegal gambling business in New York City and Los Angeles that catered primarily to multi-millionaire and billionaire clients. As part of this business, the organization ran a high-stakes, illegal sportsbook that utilized several online gambling websites operating illegally in the United States. 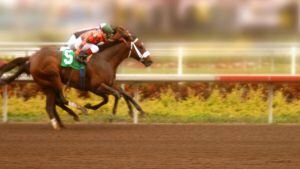 The organization booked bets that were often in the hundreds of thousands of dollars, and at times a million dollars, on a single sporting event. The organization also made millions of dollars of sports bets each year. NAHMAD was the primary source of financing for the illegal gambling business, and he was entitled to a substantial share of its profits. Donald McCalmont, John Jarekci, a/k/a “John Hanson,” and Abraham Mosseri pled guilty to making a fraudulent tax statement, failing to file a tax return, and causing a financial institution to participate in a lottery related matter, respectively, on January 24, 2014, and are scheduled to be sentenced on May 29, 2014, May 28, 2014, and May 21, 2014, respectively. The case is being prosecuted by the Office’s Violent and Organized Crime Unit. Assistant U.S. Attorneys Harris M. Fischman, Joshua A. Naftalis, Peter J. Skinner, and Kristy J. Greenberg of the Violent and Organized Crime Unit are in charge of the prosecution. Assistant U.S. Attorney Alexander Wilson of the Office’s Money Laundering and Asset Forfeiture Unit is responsible for the forfeiture aspects of the case. Subject: LongIsland.com - Your Name sent you Article details of "Art Gallery Owner Sentenced to One Year and One Day for Being a Leader of an International, Multi-Million-Dollar Illegal Sports Gambling"